YogaFit Kids: Why Play Yoga with Kids? Why Play Yoga with Kids? By Stephanie Adams, Creator/Author YogaFit Kids! YF Kids teaches children positive play, yoga poses, breathing activities, share circles, laughter and partner yoga, and other cooperative learning activities to develop self-esteem, character, creativity, positive social interaction, emotional balance, and bodily and kinesthetic intelligence and awareness. Many children rarely have the opportunity to explore “within”, to take the time to check in with their bodies and minds. In addition, the statistics relating to health, fitness and obesity in children today are daunting. Yoga is a great way for all children to learn to enjoy movement, to increase body awareness and self esteem, and to empower them to take responsibility for their overall health. At a time in our history where kids are busier than ever and, subsequently, feeling more stress, yoga is an amazing tool and gift. Teaching yoga to kids is an enriching and rewarding experience. Many children rarely have the opportunity to explore “within”, to take the time to check in with their bodies and minds. In addition, the statistics relating to health, fitness and obesity in children today are daunting. Yoga is a great way for all children to learn to enjoy movement, to increase body awareness and self esteem, and to begin taking responsibility for their overall health. At a time in our history where kids are busier than ever and, subsequently, feeling more stress, yoga is an amazing tool and gift. The essence of yoga is breathing, feeling, and listening to the body without competition, judgment and without expectations. In a kids yoga class, we foster a supportive and nurturing learning environment blended with the playfulness of mindful movement. When I began teaching to kids, I sometimes struggled with creating this environment. The public elementary school my daughters went to in West Seattle did not have a physical education teacher. Because I had education and experience in yoga and fitness, I thought that would be a great place to volunteer my time. I had no idea that what started as such a simple karmic contribution would bring so much joy and wisdom my way. Through volunteering in the classroom, attending an educational cooperative learning workshop with the faculty, and as a volunteer physical education and yoga instructor in the gymnasium at Gatewood Public Elementary School in Seattle, I was introduced to a wonderful way of learning. I had the opportunity to work with several great teachers. It has been through my work at Gatewood over six years that I came to learn how to use educational principles like cooperative learning, critical thinking, multi-age teaching, inclusiveness, and multiple intelligences as amazing tools for instruction. 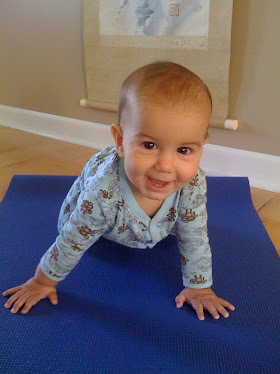 As I began using these tools in kids yoga classes, I started seeing amazing results. When I was introduced to the work of Dr. Spencer Kagan, I was delighted to find a method for instructing that supported the essence of yogic philosophy. Starting with yoga games and activities developed by myself and the kids and later applying Dr. Spencer Kagan’s concepts of cooperative learning as outlined in his book, Silly Sports & Goofy Games, we turned these games into more playful opportunities for learning yoga. In addition, putting our creativity and critical thinking skills to work, we modified traditional and cooperative learning games to turn them into opportunities for learning yoga. The result was greater participation, more involvement by all students, and it became increasingly easier for children to love yoga. More students were now able to enjoy the benefits of yoga for kids. For example, choosing to have ¼ of the kids be IT in a game of yoga tag, instead of just one kid, greatly increases participation and cooperation and teambuilding. The game becomes fun for everyone, the emphasis is taken off of competition, and one kid is not feeling the isolation and pressure of being IT. Labels: Why Play Yoga with Kids?